Product prices and availability are accurate as of 2019-04-15 00:55:29 EDT and are subject to change. Any price and availability information displayed on http://www.amazon.com/ at the time of purchase will apply to the purchase of this product. 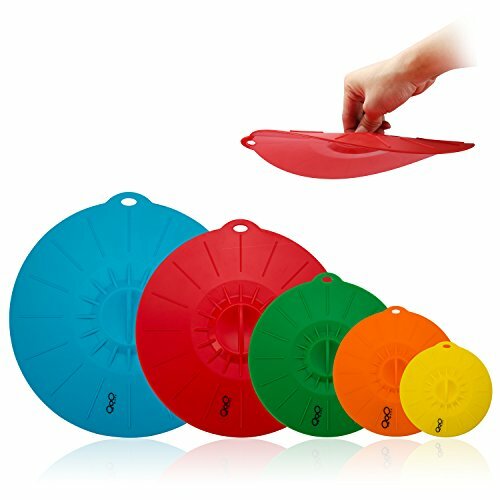 This silicone lid set is an essential kitchenware that is environmentally friendly and safe. Use these to keep food fresh and leftovers hygienically stored on the table or in the refrigerator. 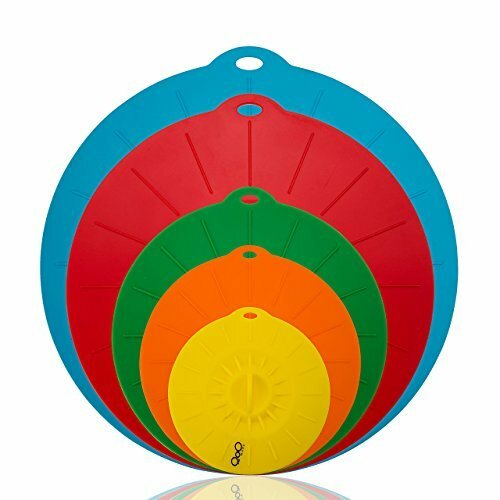 The lightweight and non-breakable silicone material makes it safe to use even when there's children around. It's every homemakers' ideal kitchen ware material that is stain-resistant, easy to clean -dishwasher safe, and convenient to store. It also features a suction like seal on glass and ceramic bowls and containers that have smooth rims. Using silicone lids is economical compared to using plastic food wrap or aluminum foil. It is a money-saving option that does away with unnecessary waste or garbage. It is definitely a simple solution that can be reused and with this set, it comes with 5 size varieties in fun colors for your mugs, serving dishes, skillets, and bowls. 100% FOOD GRADE SOFT SILICONE - Safe, BPA-free, odorless, and non-toxic. It's heat resistant and can withstand up to 450 degree Fahrenheit. For home and commercial use. SET OF FIVE LID COVERS - Lid sizes fit most food containers such as cups, mugs, plates, pots, bowls (4, 6, 8, 10, and 12-inch lid option). HYGIENIC FOOD COVER - Shields food from dust, insects, and dirt especially when having a picnic or outdoor barbecue. Great for daily use and parties. Retains food freshness and best for storing leftovers and as an oil splatter cover. ECO-FRIENDLY&EASY TO CLEAN - No worries about rust and stubborn food and beverage stains. Safe to the environment and no more need of disposable plastic food wrap and aluminum. SUCTION DESIGN SURFACE - Easily fits and provides ultras airtight seal on smooth rimmed containers or kitchen ware made of glass, ceramic, or porcelain.